It's always a good day when my Ipsy bag arrives, I must say! Honestly, I think I must be really easy to please these days, because even if the bag doesn't blow my mind I'm always more than happy to stay with the subscription and see what's coming next month. I don't even know how long I've been an Ipsy subscriber by now, but I just keep going strong like so many other people. 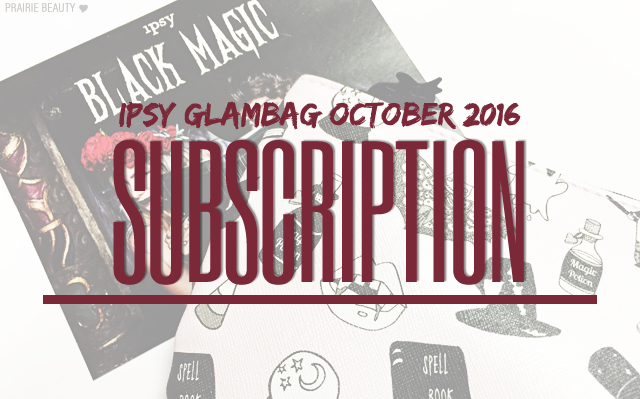 ANYWAY, this month's theme is Black Magic, because Halloween is basically crack for the beauty obsessed (myself included). The bag is ADORABLE with art by Valfré all over it and a super cute ghost shaped zipper pull. But what about the contents, you ask? Keep reading to see what I got this month! I tried looking for eyeshadow singles from Beauté Basics, but I couldn't find any at all, so I have no idea if this is even a thing. 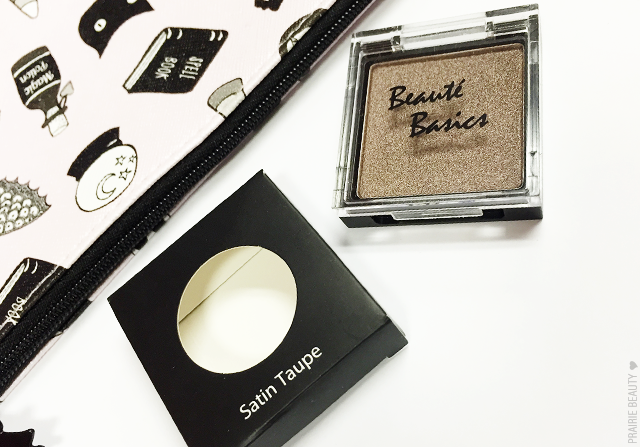 Either way, I wish that it was because this shadow is GORGEOUS and I'm dying to put it on my eyes. 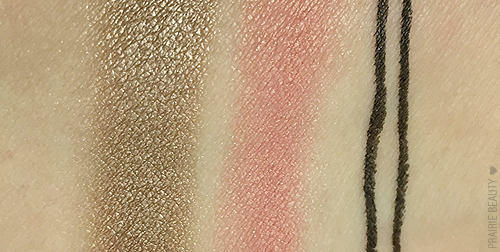 The really classic shimmery taupe shade is right up my alley, of course, but the formula is so smooth, buttery, and pigmented in swatches that I'm beyond impressed. I hope this lives up to the swatch when I put it on the eye. 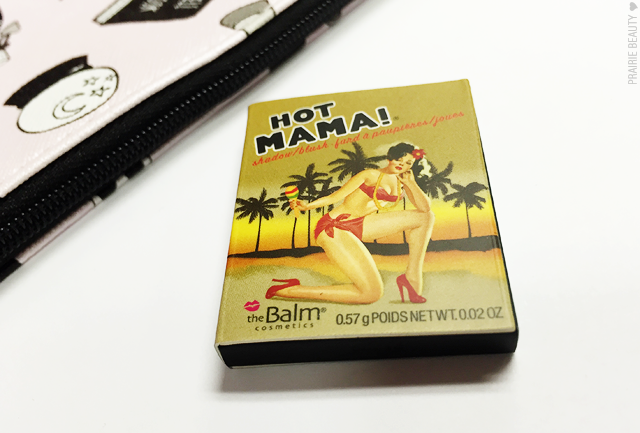 You may recall that either late last year or earlier this year, there was a bit of a tear in subscription boxes and bags of these teeny tiny little samples from theBalm. And if you've been reading this blog for a while, you'll know that I am pretty consistently annoyed with the tininess of the sample. That said, I've been curious about this blush for a while and this is a usable sample so I'm going to give it a go and be happy that I have it. So... on the wall next to my vanity I have a shelf that is absolutely full to brimming to with hair products - many of which are actually in travel sizes that I've gotten in subscription bags and boxes, and I rarely seem to get through them. Mission: Actually use up all of the hair treatments and leave in's that I have. It really is for that reason alone that I'm not jumping up and down about this, but it does seem nice enough and I might just pass this one along to someone in my life with a slightly smaller collection of hair products and perhaps more inclination to actually use them. I've actually been wanting to try this eyeliner, but I would have rather bought it myself since it's widely available and so affordable than to get it in a subscription. I'd much rather have gotten the Kat Von D or the Ciate liners, which I'm sure will be a surprise to no one. Anyway, this is a LONG tip and I'm not sure I'm going to love it... but about 2 hours before I started typing this I tried it on the top of my pointer finger on my left hand and I've rubbed at it several times since and it's still going strong. Impressive! 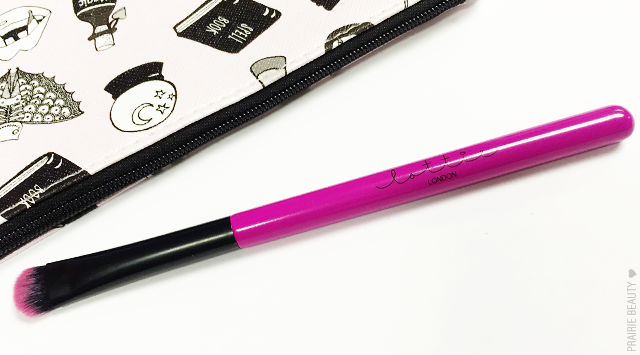 Honestly, I don't care what brush I get in an Ipsy bag, I'm pretty much always going to be glad I got it. When it's the kind of brush I use to pack shadow on my lid literally every single day, even better. I am INCREDIBLY lazy and hate washing my brushes, so the more in my collection the longer I can go between washings. This is lazy girl logic, I realize... but I never said I wasn't a lazy girl! Anyway, this brush is really nice. The bristles are really soft and densely packed enough that it will be able to lay down colour nicely, but not so stiff that you can't lightly buff shadow in with it. It's good. Also, the branding is SO cute. Normally, this is where I would put the total value of the bag, but since the eyeshadow doesn't seem to actually exist in nature I have really no idea how much this bag is technically worth. For me, though, I think I would find the value to be right around what I paid for the bag. It's not a bad bag, not by any means, but I just feel like I always want my Ipsy bags to be a little bit more than this one was. 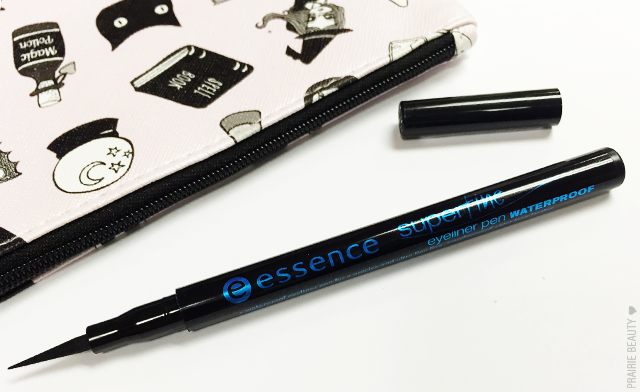 I suspect it's the essence liner that's actually throwing me off, but whatever... 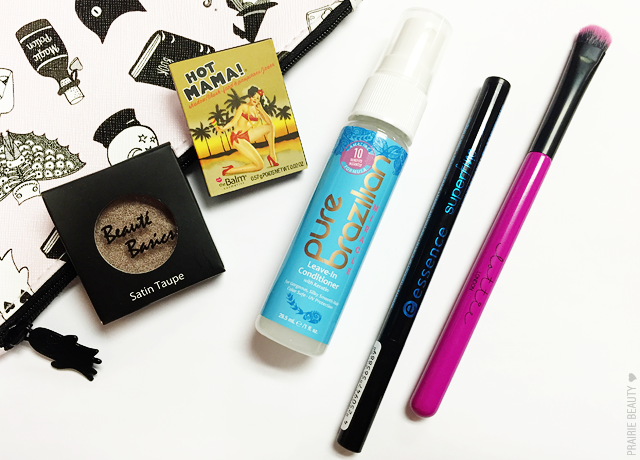 I still love Ipsy and am already looking forward to next month! If you're interested in joining Ipsy, I'd love if you'd use my referral link! For $10US (plus $5US shipping for us Canadian subscribers), you'll get a makeup bag filled with 5 sample and full sized products every month. I feel like the spiel is unnecessary, but I still make it JUST IN CASE someone happens to stumble upon this who hasn't heard of Ipsy before!